Building muscle isn’t just about how many reps you can do at the gym. If you want to get bigger and stronger, you’ll need to supply your body with the right fuel, which will help you recover from your workout and increase your gains. These six breakfasts will give your body the protein it needs – plus other health-boosting nutrients. Eggs are a nutritional powerhouse. They’re a healthy source of fats, proteins, vitamins and nutrients. They’re an ideal food for muscle building because one egg contains six grams of protein with all nine essential amino acids. Amino acids are the building material your body uses to create muscle. Plus, eggs are also an excellent source of iron, phosphorous, selenium, Vitamins A, B12, B2, B5 and omega-3 fatty acids. There are dozens of ways to make eggs, but here’s one recipe to try on for size. 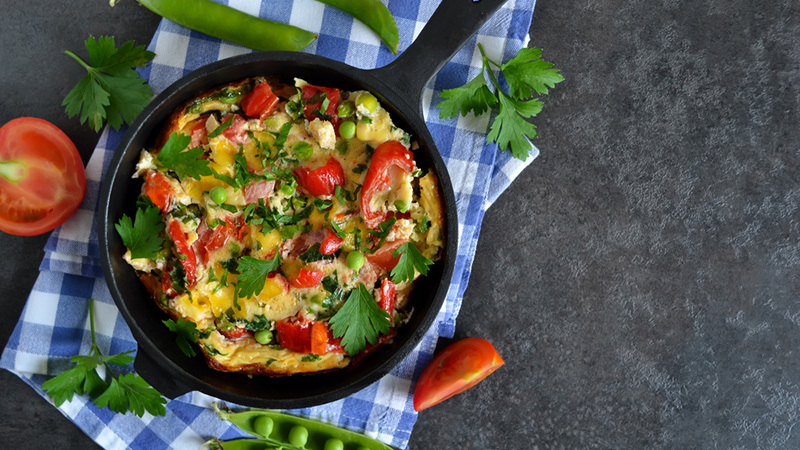 This frittata is a flavorful way to enjoy the muscle-building protein found in eggs and vitamin-rich veggies like red peppers and spinach. In a medium bowl, whisk together the eggs, milk, basil, salt and pepper. Set aside. Warm olive oil in a 10-inch nonstick skillet over medium heat. Add the red peppers and spinach. Cook 3 to 4 minutes until spinach is wilted. Add egg mixture to the pan. Using a spatula, occasionally lift the edges to allow uncooked egg to run under. When the frittata has set, transfer to the oven and cook for 12 to 15 minutes or until the egg is cooked through. Cut into wedges and serve warm. This breakfast is easy to make, and it’s ideal for a post-workout meal. 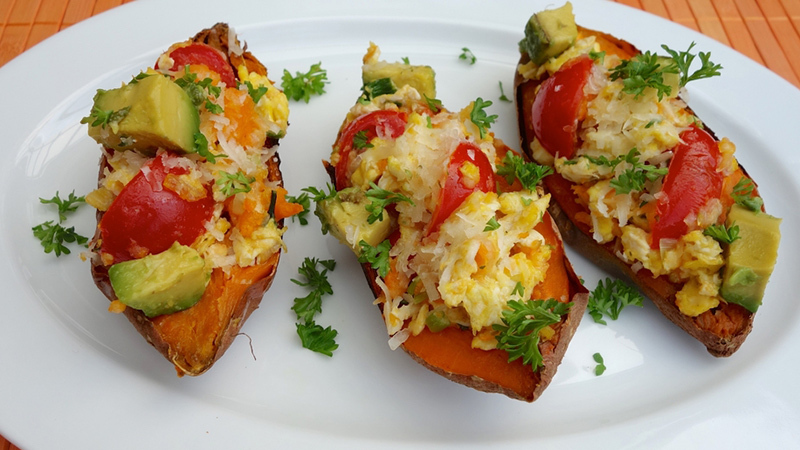 The sweet potato provides your body with healthy carbs to replenish depleted energy stores, and the egg delivers amino acids to help repair muscle fibres. Add avocado, tomato, chives, shredded cheese — any toppings you want, basically! — to kick this dish up a notch. Preheat oven for 400 degrees F.
Wash the sweet potato and puncture several times with a fork. Bake it for 45 minutes. Then remove it from the oven. Change the oven temperature to 425 degrees F.
Cut open the potato and scoop out ¼ of the flesh. Crack the egg into the potato. Bake it for 18 to 20 minutes. Whey protein powder is popular among serious lifters for good reason. Drinking whey powder is a quick and easy way to get a large dose of protein rich in amino acids. 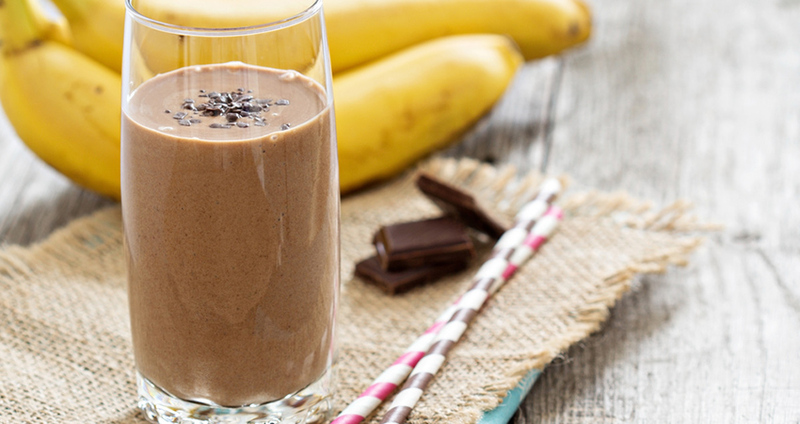 The benefits of consuming whey may go beyond just getting in a fast dose of protein. A study published in Nutrition and Metabolism found that dieters who took a daily whey and amino acid supplement lost 6.1 per cent body fat and preserved their lean mass better than dieters who were given a placebo to drink. Several studies have found evidence that suggests consuming whey might even protect you from metabolic disease too. As with any supplement, don’t overdo it and be sure to use it in cycles. 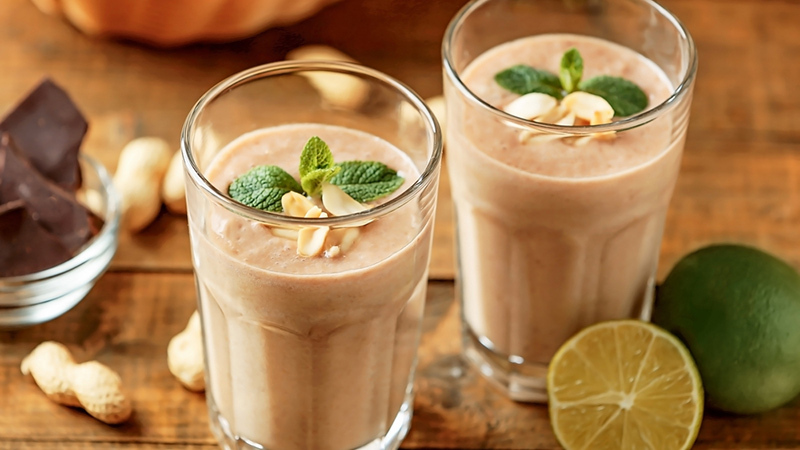 Try blending smoothies that incorporate whey protein, nutrient-rich fruits and veggies, along with healthy fats. 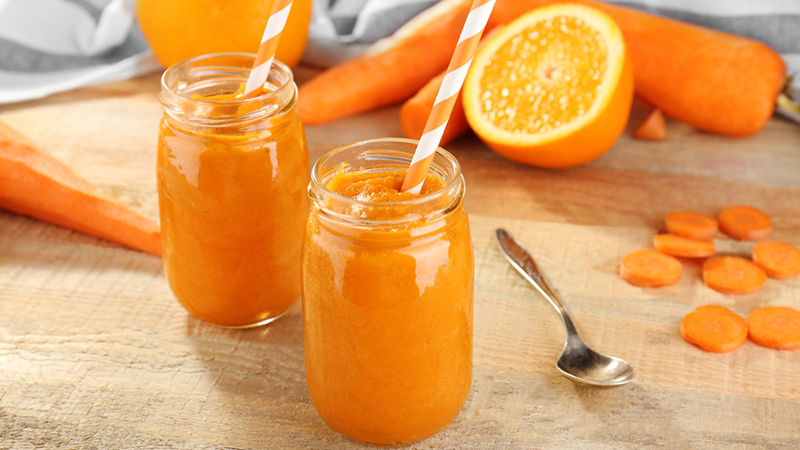 These smoothies are filling, tasty and go a long way toward refueling your body between lifting sessions. Blend together until smooth. Sweeten to taste with honey. Makes one serving. Blend together until smooth. Sweeten to taste with stevia. Makes one serving. Cereal grains and porridges are classic breakfast staples. Unfortunately, many packaged brands are laced with unhealthy sweeteners and are low in muscle-building protein. If you like to start your morning off with a warm and soothing bowl of hot cereal, consider quinoa. Quinoa is a seed that can be cooked like a cereal grain, but unlike cereal grains, it has all essential aminos acids along with the heart-healthy fibre that porridges are famous for. Cook the quinoa according to the package directions, and add the cinnamon stick and dates into the mixture as well. 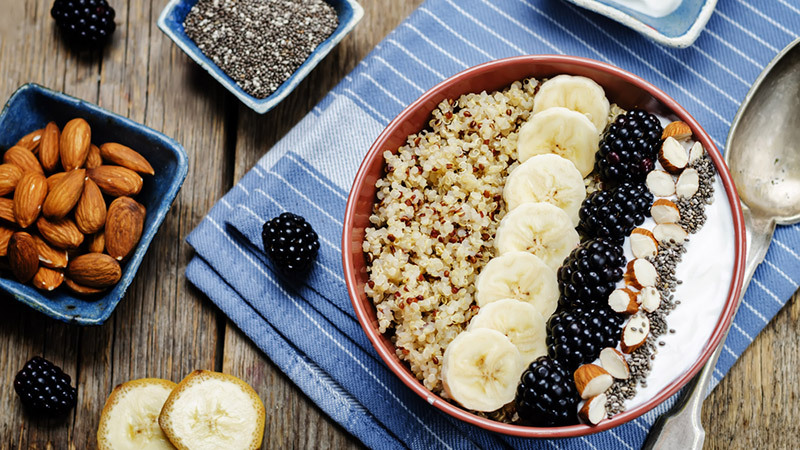 Once the quinoa is cooked, create your breakfast bowl by layering your quinoa with bananas, almonds, berries, chia seeds and Greek yogurt. Makes 2 servings.